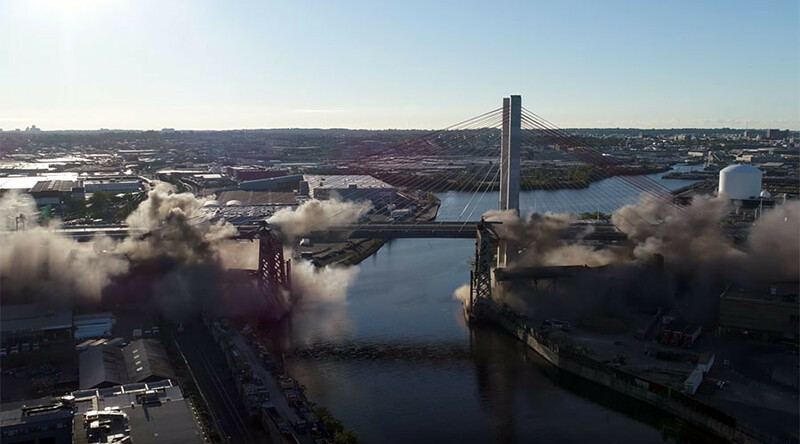 A drone has captured remarkable footage of demolition crews imploding the remnants of an old bridge that had connected the New York boroughs of Brooklyn and Queens for 78 years. The old Kosciuszko Bridge carried vehicles over Newtown Creek in New York City from 1939 until a new bridge was opened in April of this year. Sunday’s controlled demolition, which was the first ever implosion of a major bridge in New York City, will allow for the completion of the second span of the bridge which is set to be completed in 2020. An estimated 22 million pounds of scrap metal is set to be recovered from the bridge and recycled, the office of New York Governor Andrew Cuomo said in a statement. "After years of stagnation and stunted ambition, we are building across the state bigger and better than before,” Governor Cuomo said. The bridge is named after a Polish soldier, Tadeusz Kosciuszko, who fought in the American Revolutionary War. The cost of the project to replace the bridge is set to cost $873 million.